Gain Higher Ground Review - Legitimate or Scam?!? 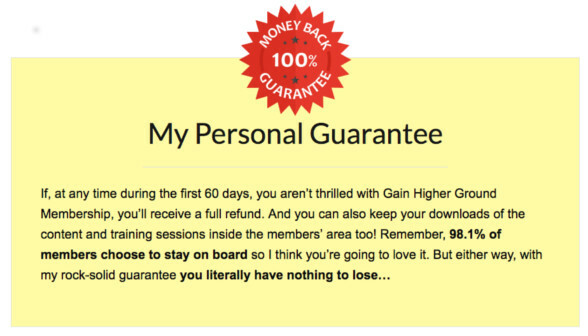 Gain Higher Ground Review – Legitimate or Scam?!? Gain Higher Ground Review – What is Gain Higher Ground all about? Is Gain Higher Ground Scam or Legitimate? Read this review now! Product: Internet Affiliate Marketing Training. 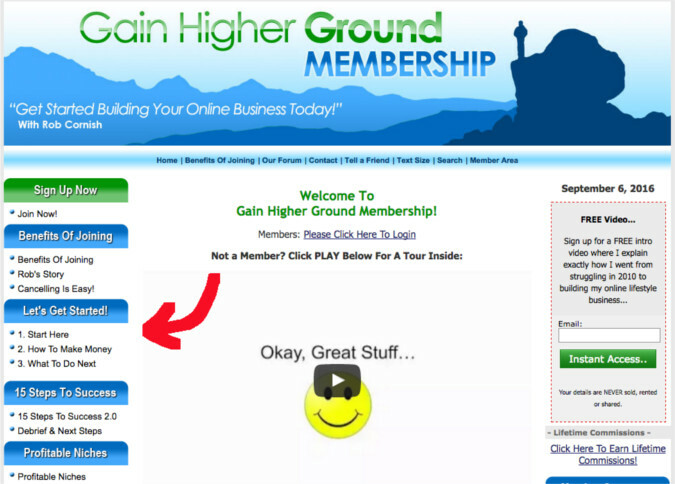 Overview: Gain Higher Ground is an Affiliate Marketing Training Membership Site owned by Rob Cornish. This Membership site contains all the knowledge of Rob Cornish of how he created his Online Business from earning $0 to six figures per year. Rob Cornish provides 1-1 support and a forum community where you can ask your questions. One of the best Affiliate Marketing Traning Membership sites available. Gain Higher Ground Review – What is it all about? I was introduced to Gain Higher Ground Membership Site when one of my readers told me that she has benefited greatly from Rob Cornish’s training. As an Online Marketing Product reviewer, of course, I am interested to find out more about Gain Higher Ground. Therefore, I began to dig around and found an introduction YouTube Video by Rob Cornish and I guess he is the best person to tell you what is Gain Higher Ground all about. Let’s take a look at this 7-minutes video by Rob. Gain Higher Ground Review – What training it has? Are you more familiar with Gain Higher Ground after watching the introduction video? In fact from Gain Higher Ground’s homepage, we can see the contents of the training clearly. Rob has laid them all straight in front of you on the left-hand side column. 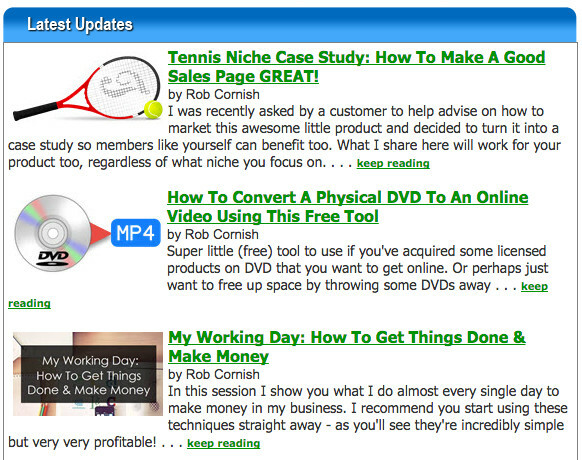 Kudos to Rob because not many Internet Marketing Training Sites are willing to do this. Unless you sign up with them first and then tons of upsells will follow. 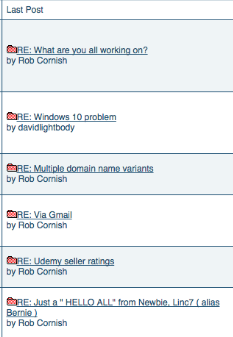 Further down the homepage, you can see the list of latest blogs by Rob Cornish. All of them are related to his personal Internet Marketing experience. There is a wide range of topics in his latest blog updates and I am a little lost at first. I guess these should be categorized as supplement materials. You can read them as and when you need them. As a new budding Internet Marketer, I would recommend you to follow his popular basic step-by-step training, 15 Steps to Success. Rob Cornish has since updated it to 15 Steps to Success 2.0. There are also eBooks, resources, and tools available for download at the Download Library within the member’s area. 101 Profitable Niches Analyzed – And How To Make Money From Them – 15,000+ word eBook on how to choose a niche. 15 Steps To Success Email Swipe File – Contains all the follow-up emails that are loaded into the Aweber autoresponder during the 15 Steps to Success training. Choosing Your Domain Names For your Personal Blog – A guide to help you choose a name for your blog. 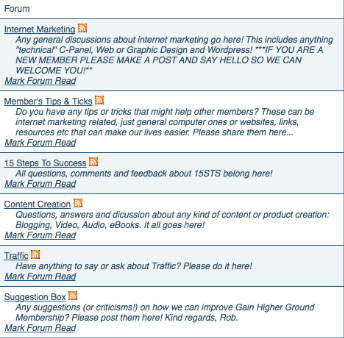 There is a members forum where topics related to Internet Marketing are discussed there. It is also observed that Rob Cornish is very active at the Gain Higher Ground Membership Forum. Gain Higher Ground Review – How much does it cost? Rob Cornish offers a 7 days trial for $5. If you stay after 7 days, you will be billed $37 monthly thereafter. There is also a 60 days money back guarantee because Rob distributed this membership site through ClickBank. Gain Higher Ground Review – My Personal Take. Gain Higher Ground provides solid step-by-step training for new budding Internet Marketers who wants to learn how to make money Online. From the introductory video and sales pitching page, Rob assures you that it is very simple by just following what he does step by step from the 15 Steps To Success training where he shows you how to build a niche website from scratch. Yes, building a website is easy, but what comes after that? There are other aspects of Internet Marketing where he did not mention. You’ll need hard work, commitment, and grit to be successful. You have to bite the bullet for the first few months because you’ll not see the money from your website until you are able to gain traffics to your website. There are SEO, List Building, Content Building, Social Media Marketing and PPC aspect of making money from your website. Job Cornish will teach you all these in his training so you do not have to worry as you progress on. What I want to emphasize here is Gain Higher Ground is not a get rich quick method. Rob Cornish did not become Successful overnight! Just imagine how painstakingly he has built his Gain Higher Ground Membership site over the years with tons of information and knowledge he has gathered. Gain Higher Ground gives me an impression that Rob Cornish is running a one man show. I understand that the whole site belongs to him and rightfully he is running the show behind it. You are tapping mainly on his own knowledge. There are 1000s of successful Internet Marketers in the World, wouldn’t you like to tab on the knowledge from them at a community where they are there to help the members? Gain Higher Ground has a forum where you can discuss your ideas and ask questions. Rob Cornish is very active there to help his members too and I applaud his commitment to his members. What I mean is an Open Education Project Community where anyone can create training for all members. Imagine the vast knowledge from different experts that you can tap on to scale up your Online Business from these training. For $37/mth to stay at Gain Higher Ground membership site is quite high for someone new to Internet Marketing because you still have to pay for your own web hosting. Gain Higher Ground membership site does not provide hosting services and Rob Cornish recommends Bluehost to his members. Most websites now are build from WordPress and for hosting an WordPress Optimized site at Bluehost you have to pay about $20 monthly. So this adds up to about $57/mth even before you talk about subscribing to an Autoresponder where you use it for Email marketing. Again, these are my personal take. I rated Gain Higher Ground 4.0 stars because Rob has set up a very good membership site sharing his vast knowledge and experience in Internet Marketing. He is already Successful, therefore I have no doubt if you follow his training closely with the right mindset, you could be successful too. It would be great if Rob tells us his Gain Higher Ground is not a get rich quick method up front. The monthly membership fee is definitely not affordable for many to start with considering there are other web hosting related costs. It would be great too if Rob could consider to lowering his membership fee so that new Online Entrepreneurs can have a better head start in their business. Traffic Lockdown 2.0 Review – Legitimate or Scam?!? What is Chris Farrell Membership? – Legit or Scam? ← Internet Income University Review – Skill Pay Closed Down?! ?